At Jonathan Walker Funeral Directors in Birmingham, we believe that a funeral service should be a personal ceremony that respectfully celebrates the life of your loved one. We are here to help you arrange the perfect farewell for your loved one, ensuring that every detail is just as you want it to be. Although we specialise in Catholic funerals, we offer all kinds of funerals including non-religious ceremonies, colourful celebrations and woodland burials. Whatever you feel is most fitting for your loved one, we will be able to help make it happen. We are here to offer you our full support 24 hours a day. As soon as you need us, please give us a call and we will do everything we can to help you. Our Simple funeral is available for £1,395 + third party costs, without compromising on the quality of the service that is delivered. Or our Full Service funeral can be tailored just how you wish, whether that be a traditional ceremony or a colourful celebration of life. Call us today on 0121 693 0204 to talk through your personal requirements. At Jonathan Walker Funeral Directors, we understand how special life is with those that you love. For us, every funeral is unique and personal. We have a service to fulfil every wish, with every detail carried out with the same uncompromising quality of care. From a traditional service, to a colourful woodland burial, your options are limitless with our Full Service Funeral. If you have a little more flexibility when it comes to arrangements, then we can provide a Simple Funeral for a lower cost. There is free parking available at our funeral home. We are located on Radley's Island. Our staff are available 24 hours a day on 0121 693 0204 if you require our services outside of these hours. Staff who are very caring compassionate at a time when someone is grieving over the loss of a loved one .Nothing is too much trouble and always very obliging and helpful . Excellent service, reliable and fulfilled all requests. Thank you for posting your review online. I am pleased that the arrangements for your Father were carried out to your satisfaction and that you were so well looked after by our team. 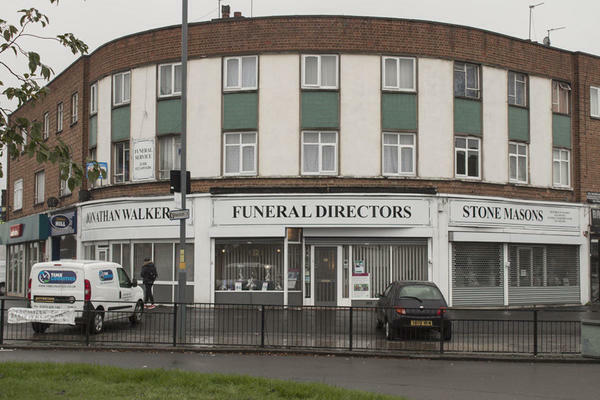 This was my second time using Jonathan Walker Funeral Directors and as before they were compassionate, caring and understanding of what we as a family required. Every detail was dealt with in a very professional way but the staff never lost sight of the fact we were grieving for our loved one. The financial side of the funeral was clearly and tactfully dealt with. Any suggestions made by the Jonathan Walker staff only enhanced the arrangements. The actual funeral and subsequent burial of the ashes could not have gone better. At this most distressing of times,the service given by Jonathan Walker Funeral Directors was excellent. Absolutely 1st class service. Helpful, diligent and courteous staff. Brilliant service provided from all members of staff. Everyone is very friendly and welcoming and they go out of their way to make sure you’re happy with everything. Thank you all so very much. Having to arrange the funeral of a loved one is without the hardest thing I have ever done. We decided on Johnathan Walker as 3 years previously they had looked after Mom’s final day. We were so looked after by Claire she thought of everything, we mentioned in conversation that we had always seen Dad on Christmas Eve and Claire arranged it for Dad to be ready on Christmas Eve enabling us to have one last special time with Dad. The care, dedication and respect we were given as a family is something we appreciated. Thank you from the bottom of our hearts for your care and professionalism shown to us and to Dad. Claire you are an amazing lady, many thanks from the White Family. We found that the service offered was excellent. Everyone we dealt with, either in person or over the phone, was professional and understanding. Nothing was too much trouble. Thank you for taking the time to complete the online review. I am glad that we were able to provide you with the care and support needed at this time and that you were so well looked after by our team. The 2 members of staff who dealt with the funeral and cemetery arrangements were courteous, kind, sympathetic and helpful. They explained all the details and questions clearly. Nothing was too much trouble. At the funeral everything was done reverently and with great dignity. They showed consideration and loving care to the family. Thank you. Thank you for the kind comments posted on your online review. I am pleased we were able to help make things easier for you and your family at such a difficult time and that you were so well looked after by our team.